Tungsten machining products have the highest melting point and lowest vapor pressure among all the refectory metals. The high strength and thermal coefficient in extremely high-temperature conditions make tungsten very suitable to fabricated as high temperature furnace parts, heating elements and arc-welding electrodes. CHEMETAL USA is a recognized manufacturer and supplier of tungsten machining products. Every tungsten machining product we supply is under stringent quality control at every stage of fabrication, including the rolling, annealing, surface treatment and a series of tests. Thanks to our experience and capacity in the field of milling tungsten product, we can always guarantee that our customers receive high-performance tungsten products, which has exceptional purity, strength, dimension, flatness and surface condition. Our knowledgeable engineers work closely with our customers to tailor the product’s parameters to the customer’s requirements. Heating elements and shields in furnaces which are machined from tungsten rod, sheet or wire can retain these excellent properties. Additionally, tungsten furnace parts can maintain a high level of chemical stability, corrosion resistance and strength throughout a long service life. 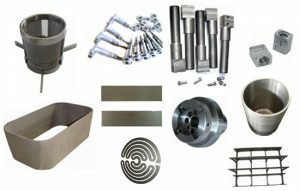 Thus, tungsten assemblies and parts are an ideal choice for users of various high temperature furnaces including hot isostatic pressing (HIP) furnace, crystal growth furnace, sintering furnace, vacuum furnace. Moreover, machining tungsten metal and alloys have been used extensively to produce furnace parts due to its very high melting point and low vapor pressure. On another aspect, the high chemical purity and homogeneity of machining tungsten makes it an ideal material to use as sputtering targets and vapor evaporation. Moreover, the ability of high density to absorb radiation and resist corrosion is invaluable when tungsten product is utilized as a radiation shielding material. Therefore, tungsten products are irreplaceable in a wide range of industries and applications including quartz glass, health care, coating processes, thermal processes and ion implantation.